If you live in the northeast, or anywhere in the U.S. for that matter, you’ve probably noticed something if you’ve been outside lately. Even though the weather still feels relatively summery here in NYC, there are pumpkins EVERYWHERE lately! Grocery stores, farm stands, corner bodegas, hardware stores, front porches, brownstone stoops, even apartment windows. Some of them are being nestled just so amidst colorful pots of hardy mums, while others are getting carved up into jack-o-lanterns with big toothy grins. You just can’t step out the front door without seeing a bunch of big orange squash all over the place. And guess what! Pumpkins aren’t just decorative, they’re also pretty damn tasty! Canned or cubed, roasted or boiled, baked into pies and cakes or simmered into stews and curries. Gimme! Gimme! Gimme! 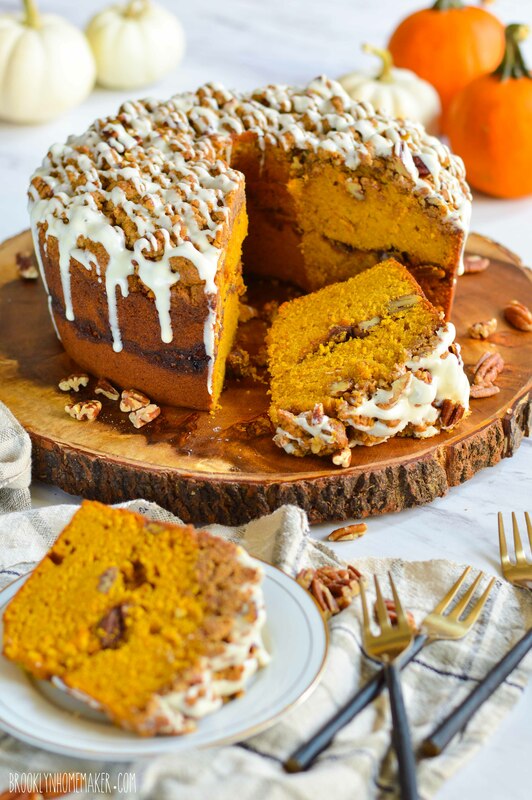 Pumpkin’s so adaptable and so universally loved this time of year that a huge part of the blogging community is coming out today to share their favorite pumpkin recipes in the Virtual Pumpkin Party! 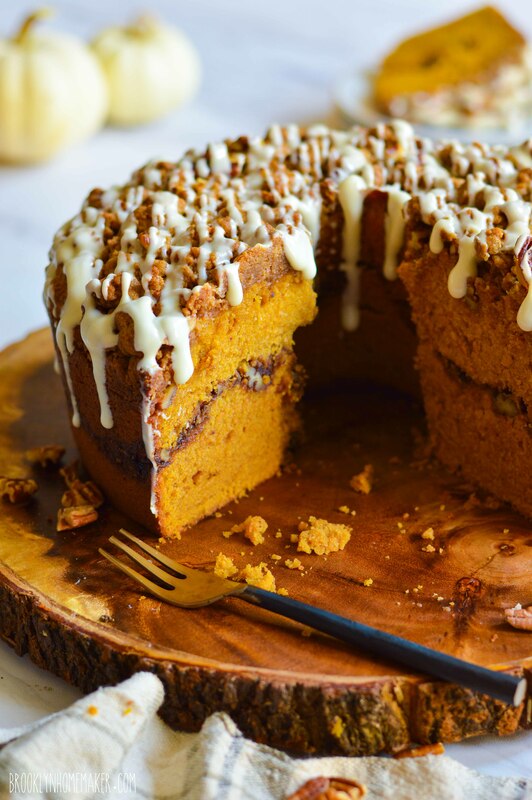 This pumpkin recipe sharing event has been hosted by Sara from Cake over Steak since 2015. 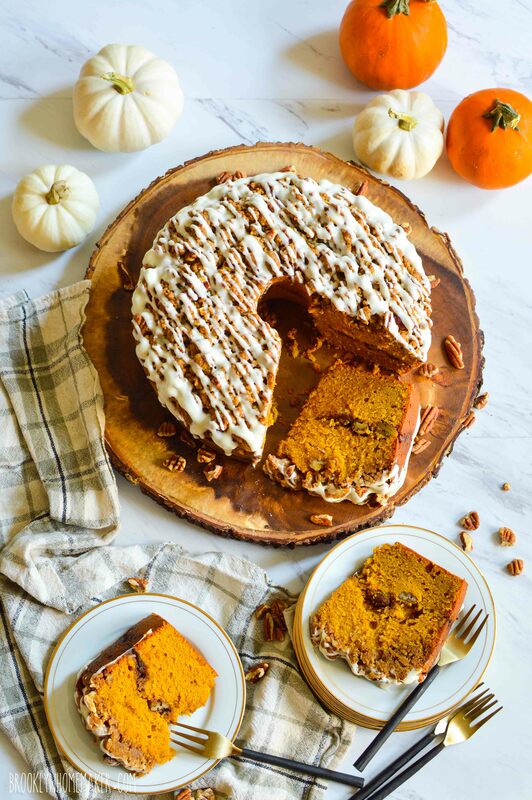 Head over to her blog to see this year’s full list of links and check out all the drool inducing pumpkin recipes that speak to the versatility of the pumpkin, along with the limitless creativity of the blogging world. 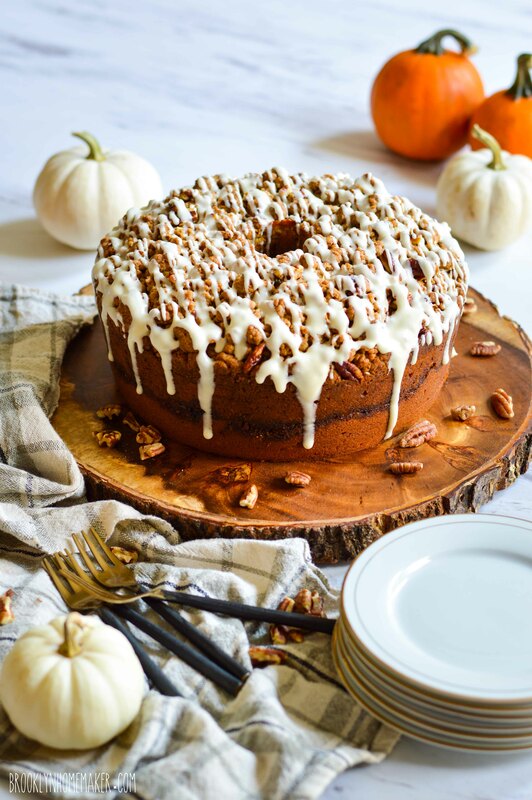 Speaking of versatility and creativity, I decided that the Virtual Pumpkin Party was the perfect opportunity for me to take my spice cake bundt recipe out for a spin and really show you what she can do. I could have just made the pumpkin purée substitution and baked a simple, yet delicious bundt cake, but I knew that I could take this recipe even further. If you’ve been reading this blog long enough you’ve probably already noticed that I’m actually a curmudgeonly old lady living in the body of a 34-year-old gay man. So, true to form, I decided to use my humble spice cake recipe as the base for a show stopping coffee cake. 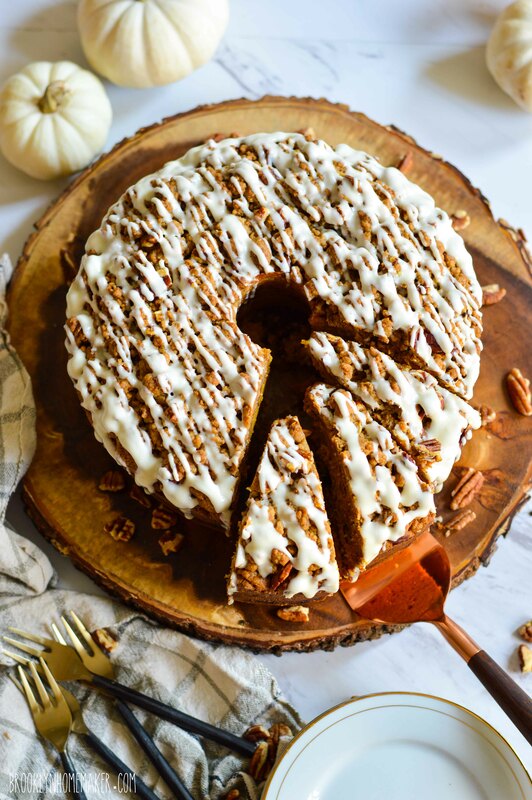 A layer of toasted pecans and brown sugar, and a topping of buttery crunchy streusel may seem simple enough, but they seriously transform this cake. The only slight change I made to the base recipe was to add just a bit more oil. 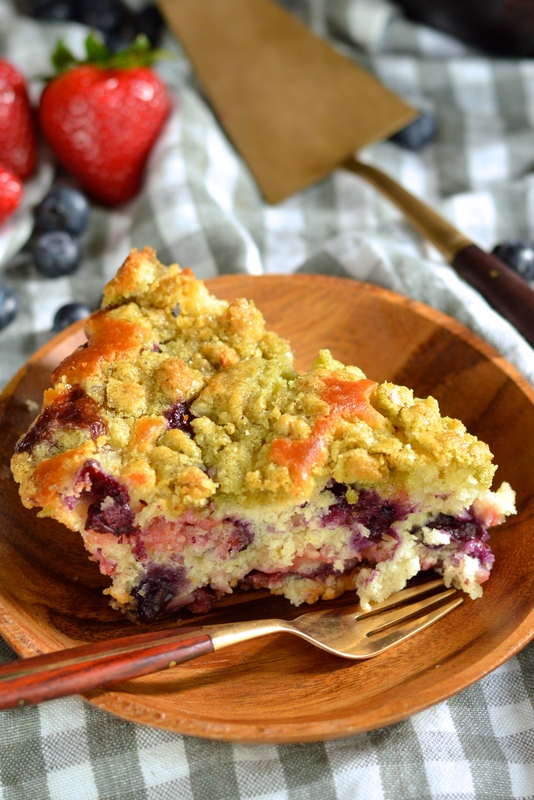 The additional ingredients and thick layer of streusel mean this cake has to bake a long time before it’s fully cooked inside, and the extra oil helps keep the bottom and sides of the cake from drying out before the interior is done. I also decided to bake the cake in an angel food pan rather than a bundt pan, because bundts are meant to be turned out of the pan and served upside down, but I wanted that gorgeous streusel topping to be the star of the show. If you don’t have an angel food pan though, just bake it in a bundt pan and serve it with the streusel side up! This cake is dense and rich and packed with heavenly, homey fall flavors. 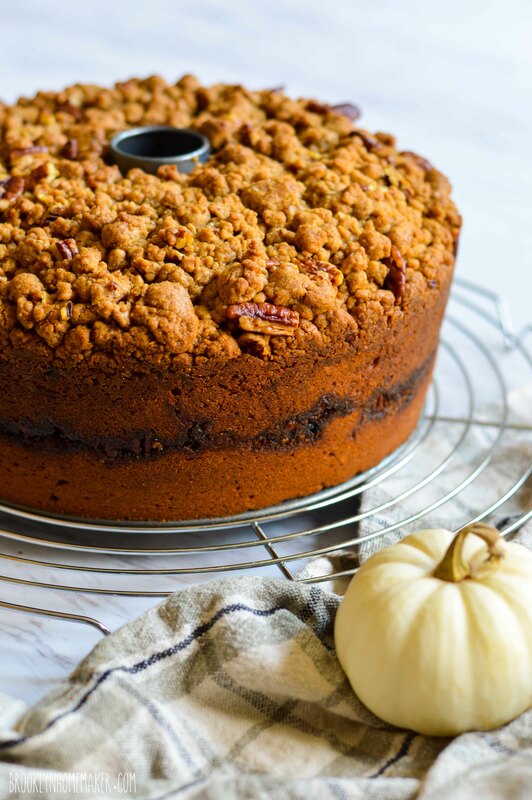 The cake itself is almost like a rich spiced pumpkin bread, the filling adds a lovely bit of toasty nutty texture, and the streusel is crunchy and buttery and salty in the best possible way. A light drizzle of cream cheese glaze adds just a touch of extra sweetness and a bit of creamy tang. I could go on, but I’m sure you get the picture. Now go preheat the oven already. Coat a large angel food pan with a removable bottom with butter and flour, or baking spray that includes flour. Refrigerate until ready to use. Toast the pecans for the filling and the streusel together on a sheet pan for about 6 to 8 minutes or until fragrant. Let the nuts cool before making the streusel. Put the flour, brown sugar, salt, cinnamon, espresso powder, and cold butter in the bowl of a stand mixer fitted with the paddle attachment. Mix the streusel slowly on low-speed just until it begins to clump together, which should take between 5 and 10 minutes depending on how cool everything is. Add the 1/2 cup of cooled toasted pecans and mix until well-distributed, about a minute. Transfer the streusel to a small bowl, cover, and refrigerate. Mix the pecans, brown sugar, cinnamon, and espresso powder together with a fork in a small bowl. Set aside. Whisk flour, baking powder, salt, cinnamon, ginger, cloves, & nutmeg together in a bowl and set aside. In the bowl of a stand mixer fitted with the paddle attachment, beat the butter, sugar, & brown sugar together on high-speed until light and fluffy, about three minutes. Scrape down the sides of the bowl and add the eggs, one at a time, scraping between additions. 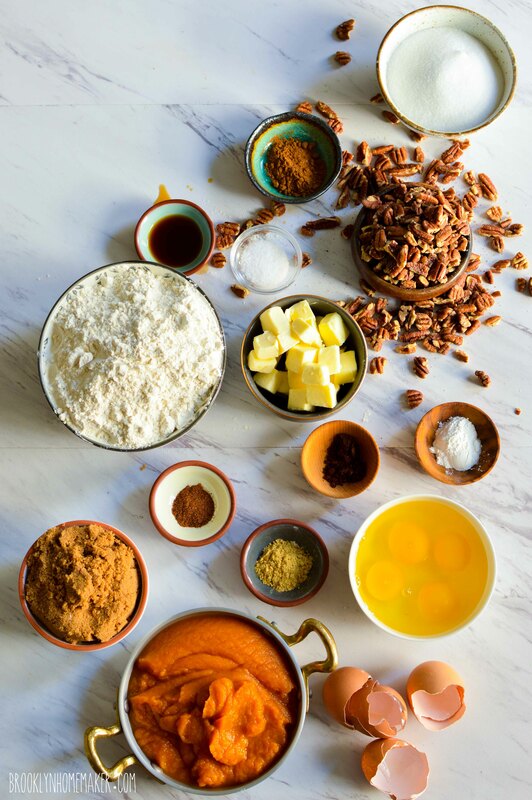 In a small bowl or measuring cup, stir together oil, vanilla, & pumpkin purée. In the bowl with the butter and sugars, alternate additions of the flour and buttermilk mixtures at low-speed, beginning and ending with flour. Mix just until combined and do not overwork the batter. Scrape down the sides of the bowl to make sure all ingredients are well incorporated. Pour about half the batter into the prepared pan and smooth out the top. Sprinkle the filling over the batter in an even layer, then top with remaining batter and smooth out. Firmly pound the pan against the countertop several times to tap out any air bubbles, then add the topping in an even layer. Bake in the center of the oven for 65 to 70 minutes, or until a toothpick or cake tester comes out clean from the center of the cake. Transfer the pan to a wire rack to cool completely. Once cool, remove the cake from the pan and drizzle with cream cheese glaze (recipe below) if desired. Cake should keep, in an air tight container at room temperature, for about 3 or 4 days. In the bowl of a stand mixer, beat the cream cheese until it’s soft and smooth and light. Add the powdered sugar, vanilla, and 3 tablespoons of milk and blend until there are no lumps. If necessary, add more milk, a tablespoon at a time, beating after each addition until the glaze reaches the desired drizzle-able consistency. It should be about the consistency of thin melted ice cream to drizzle correctly. Place a tray under cake and cooling rack to catch any drips. I used a small squeeze bottle to get a thin even line of drizzle and let some of the streusel show through. You could also do this by cutting a small hole in a sandwich bag, or you could make your life easier and just pour the glaze over the whole top of the cake. This recipe will probably make more glaze than you need, but it’s tough to make a smaller batch with an electric mixer, and without a mixer it won’t come out as creamy and smooth. It’s great though, so I promise you won’t be sad that you’ll have extra. I know I’ve been posting a lot of recipes with strawberries lately, but strawberry season is fleeting and I need my fix okay? I mean, strawberries are pretty freakin amazing so you should probably have your head checked if you find yourself taking issue with my posting too many* strawberry recipes. I grew up loving strawberries, and all berries for that matter, thanks in part to my grandfather’s garden. Grandpa’s garden is actually larger than the footprint of his house, and the house itself is actually pretty large. Several years ago an insurance company flew over his house taking aerial photos of homes in the area after a big storm. Luckily there wasn’t any damage to his property, but they mailed him a glossy 8×10 that he framed and hung over his favorite recliner in the living room. Until then I’d never realized just how big the garden was, but seeing it from overhead really put it’s size into perspective. In addition to the garden he also has a small orchard filled with apple, pear, plum, & peach trees; a trellis weighed down by grapes stretching the length of his barn; and a separate patch of walnut and chestnut trees shading the lawn behind the barn. It’s basically my mission in life to eventually have a piece of property as large, beautiful, and bountiful as my grandfather’s little oasis in the Fingerlakes. For now though, I’ll have to be satisfied with trips to the farmer’s market instead. Within the garden itself he’s always got rows and rows of tomatoes, squash, peppers, and beans, along with a huge strip of asparagus, but his berries have always taken up the largest portion of his plot. He used to have a big stretch of raspberry bushes, but they attracted japanese beetles so he took them out a few years back. His latest and greatest joy is his blueberries, and every time I visit he’s talking about a new soil amendment he’s trying to get higher yields, or a new trick he’s testing out to keep the deer away. As far back as I can remember, his strawberry patch has taken up almost a full quarter of the whole plot. Growing up we used to spend hours picking strawberries with Grandpa and carrying bowls of them into the house to help Grandma clean them. As soon as they were washed she would hull and slice them, macerate them in sugar, and freeze most of them to eat in the colder months to come. Oddly enough Grandma and Grandpa weren’t big fans of eating strawberries in their fresh natural state, though my sisters and I certainly ate plenty. 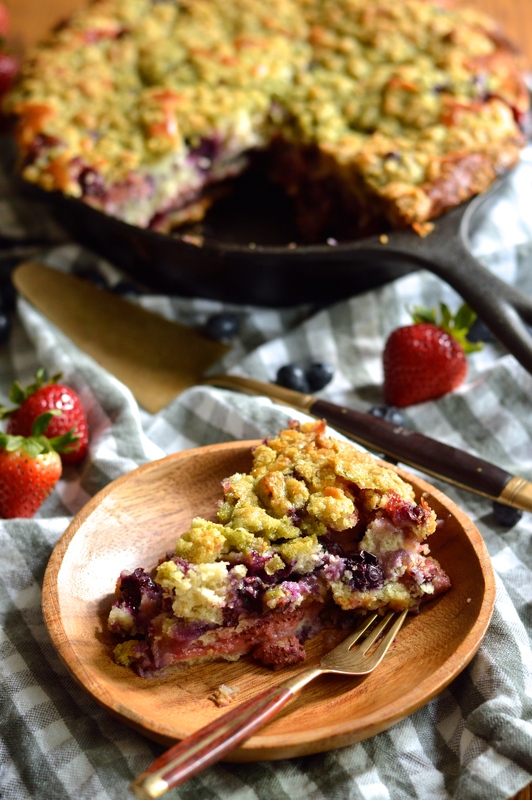 What better way to celebrate the first official week of summer than combining two of Grandpa’s favorite berries with a simple, tender crumb cake baked in a cast iron skillet? While Grandpa doesn’t grow basil I decided that I’d try using up some basil sugar in the streusel topping just for kicks. I have a bunch of basil sugar left from my birthday cake experiments, so why not? I thought the basil flavor, rather than using the more traditional cinnamon, might make this cake taste even more summery and bright. The base of this cake is moist, tender, buttery, and perfect. 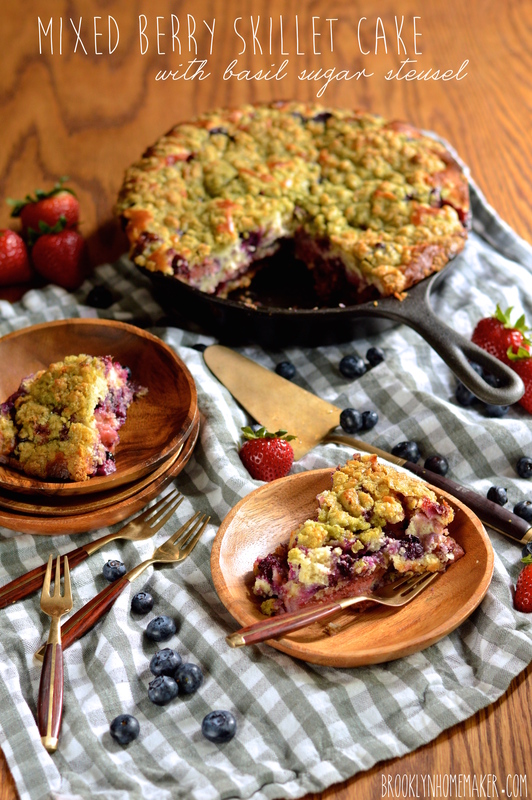 Thanks to being baked in a skillet, the sides are almost as crunchy as the crumb topping. It’s absolutely bursting with fresh ripe berry flavor brightened up with a touch of lemon. There are so many berries that the cake practically fell apart when I tried slicing it before it was completely cool. 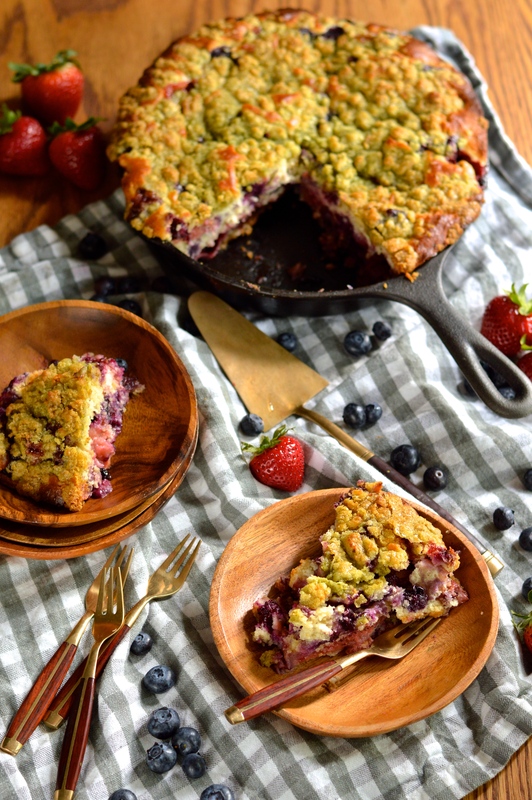 The streusel topping adds even more warm weather brightness with unexpected hints of fresh green herbal loveliness from the basil sugar (and plenty of butter). 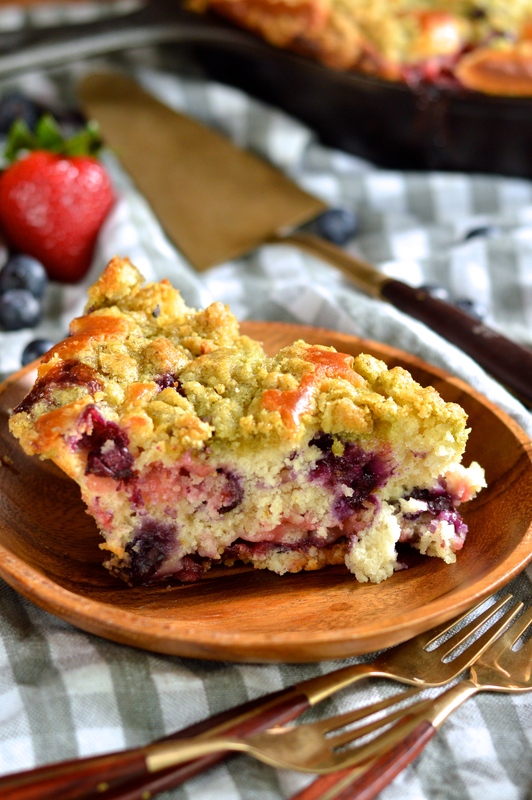 While I think the basil sugar kind of elevates this cake into a whole new level of summer perfection, I know it might sound kind of crazy to some of you. If you’re not feeling quite as adventurous and I was, and would prefer a more traditional streusel topping, feel free to skip the basil and add 1 teaspoon of cinnamon instead. Using a food processor (or mortar and pestle), prepare the basil sugar by grinding the basil into a paste fist and then adding the sugar and pulsing until very well mixed. The sugar should absorb the basil pulp and turn vibrant green with a texture similar to that of brown sugar. Prepare the topping by mixing the flour, sugar, and salt, then cutting the butter in with a pastry blender or fork (or even your fingertips) until the mixture resembles coarse crumbs. Refrigerate while you make the rest of the cake. In a medium bowl, whisk together the flour, baking powder, and salt until well combined. In the bowl of a stand mixer (or a large bowl with handheld mixer), cream together the butter, sugar and lemon zest until light and fluffy (about 3 to 5 minutes). Add the egg and vanilla and beat until combined. Mix lemon juice into buttermilk. Alternate 3 additions of flour and 2 additions of buttermilk, beginning and ending with flour, mixing until just incorporated after each addition. The batter should be quite stiff. 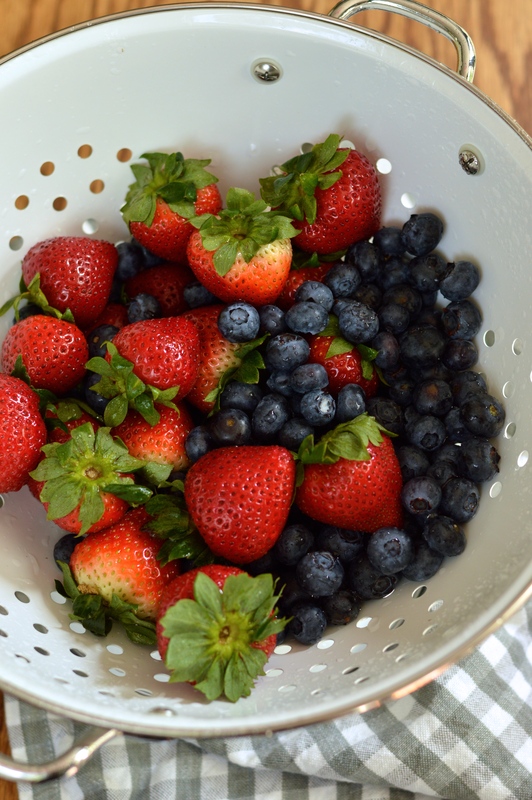 Use a wooden spoon or rubber spatula to gently fold in berries until evenly distributed. 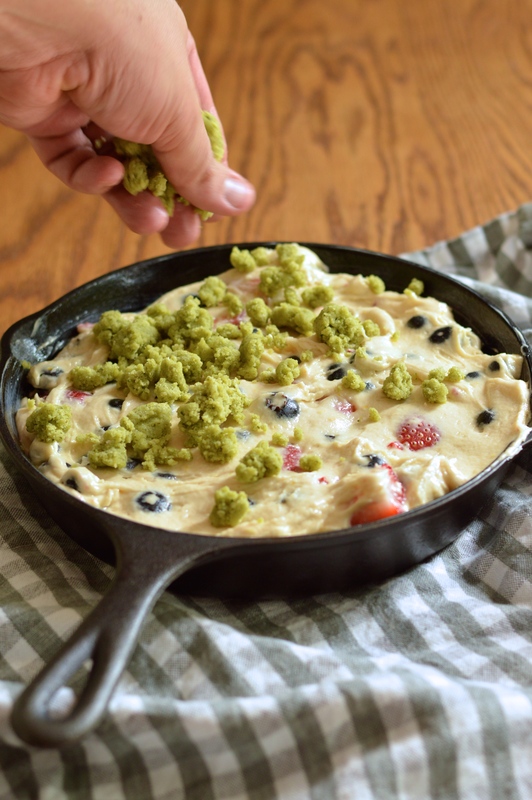 Spread batter into prepared skillet and smooth it flat. Sprinkle with prepared streusel, breaking it up as you go if it’s clumped together. Bake in heated oven for 45 – 55 minutes, or until a toothpick or cake tester inserted into the middle comes out clean. Let the cake cool for at least 30 minutes (an hour is better) before slicing. 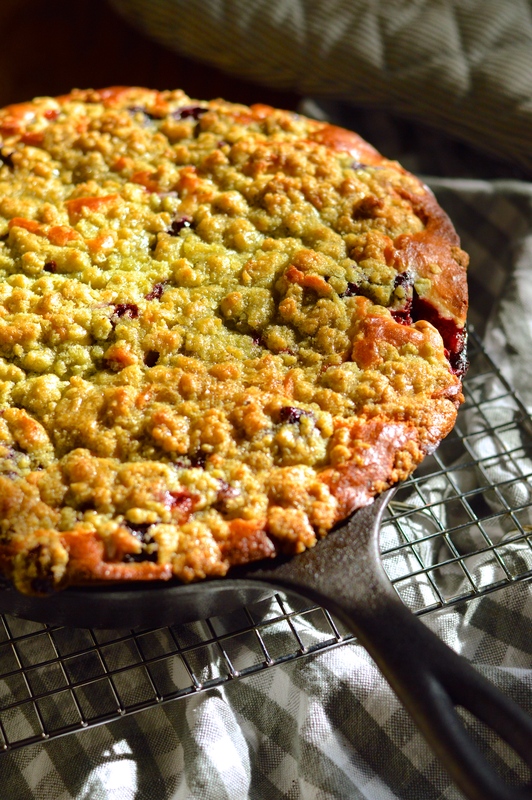 Remove the cake from the skillet for storage if there’s any left (there won’t be). Cake should keep, well covered at room temperature, for up to three days (or a bit longer in the fridge).